Magic is real, but Tara’s life isn’t a fairy tale. From humble beginnings, Tara’s managed to work her way into a great job researching Dark Energy, aka “magic,” in Chicago. She has a beautiful house she renovated with her own hands, and a loving extended family, but she hasn’t found her soulmate … Not that she believes in soulmates. Lionel is a Light Elf. Despite being of dubious heritage and being born a peasant, he’s risen in the ranks to serve the Elf Queen. Like all true elves, Lionel has a soulmark to identify his soulmate … He just hasn’t found her yet. 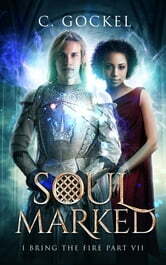 When Lionel’s and Tara’s lives collide and Dark Elves strike, they’re forced to work together or perish. Friendship and more grows between them, but dangers loom … Tara is more important than she knows, and Lionel is more important than he wants to admit. Both of them have choices to make. Will Lionel choose a “perfect” love over Tara? How much is Tara willing to give up for a happily ever after? They might find that in an uncertain world, the love you struggle for is the only certain thing.